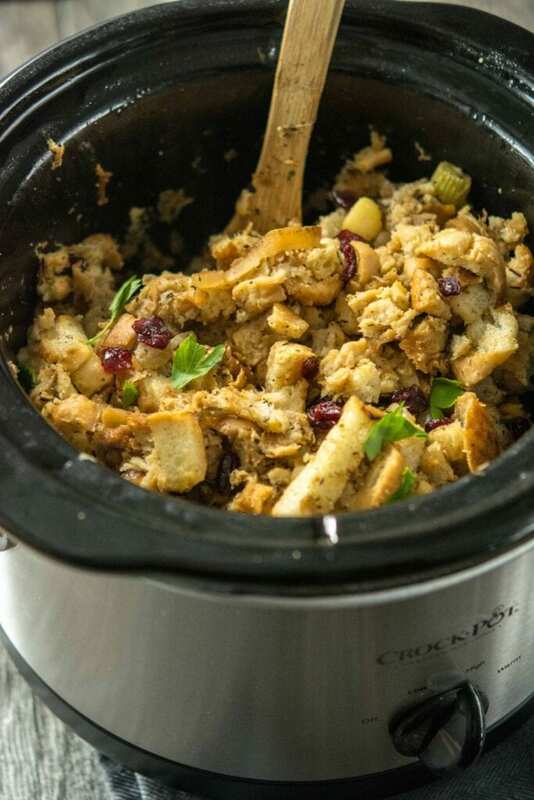 Slow Cooker Stuffing with Caramelized Apple is a delicious twist on a holiday tradition. 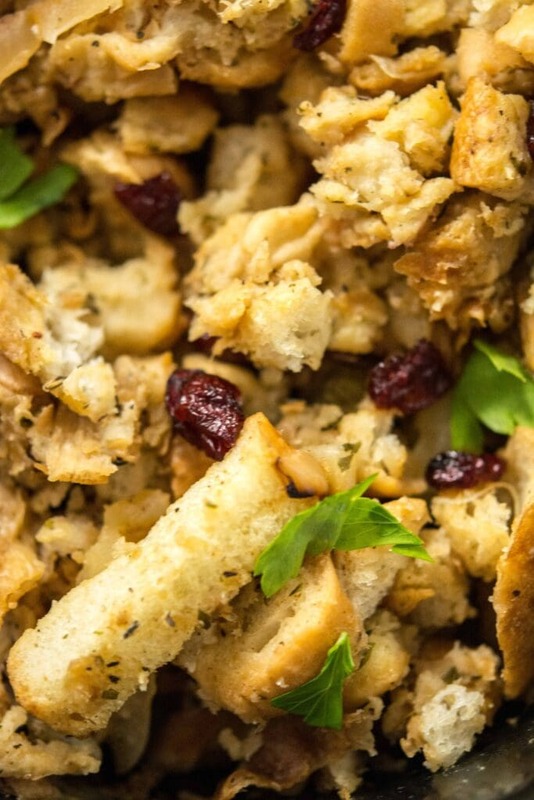 Flavors of fall that are perfect for your Thanksgiving dinner! Well? How’s it going? If you are cooking for Thanksgiving, is your menu done? Have you starting grocery shopping? Finished? I think I just finished up today but I’m fairly certain I’ve forgotten at least 1 thing. Or 7. But still, I’m pretty pumped that I have most of what I need and have carefully planned out just the right amount of slow cookers to use. 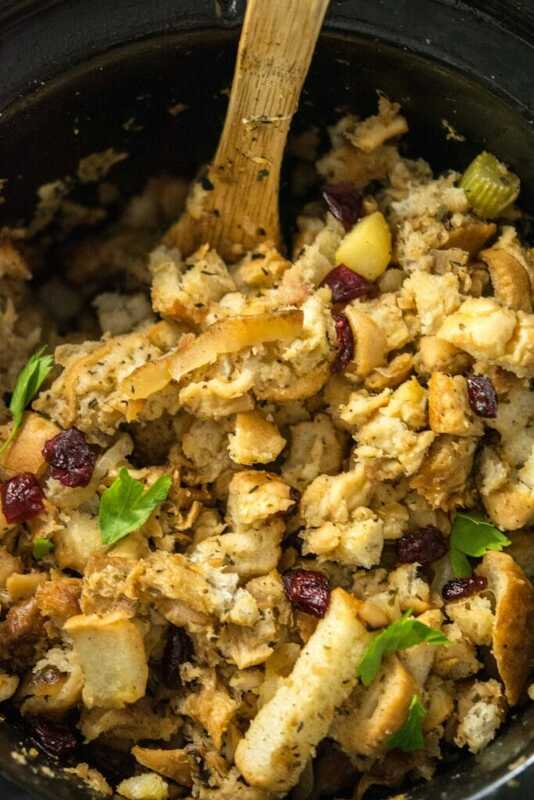 I’m pretty sure on Turkey Day we will actually end up eating Stove Top Stuffing at the request of my family (which totally works for me, by the way!) 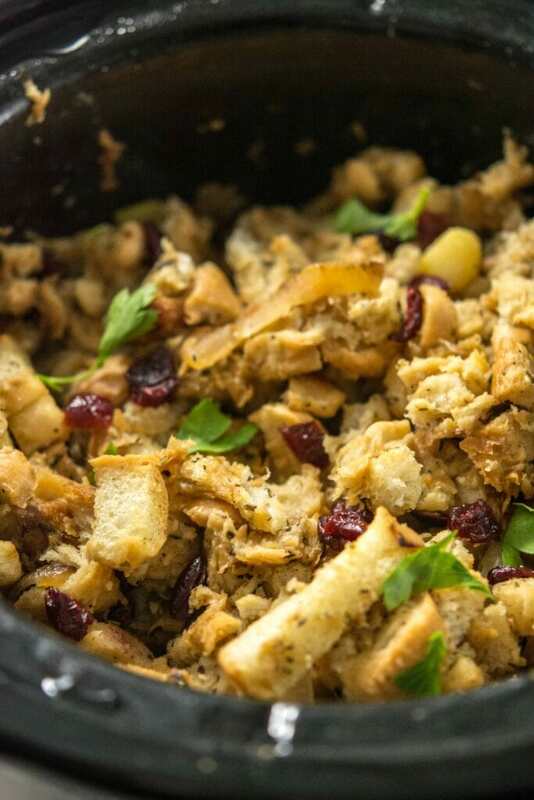 but I did want to play around with the idea of creating a homemade stuffing this year. 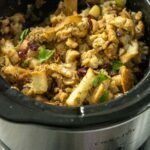 Therefore, Thanksgiving came a little early at our house this year and we had this Slow Cooker Stuffing with Caramelized Apple the other day along with some yummy BBQ chicken! Verdict? We all actually really liked it! Enough to change our years long tradition? 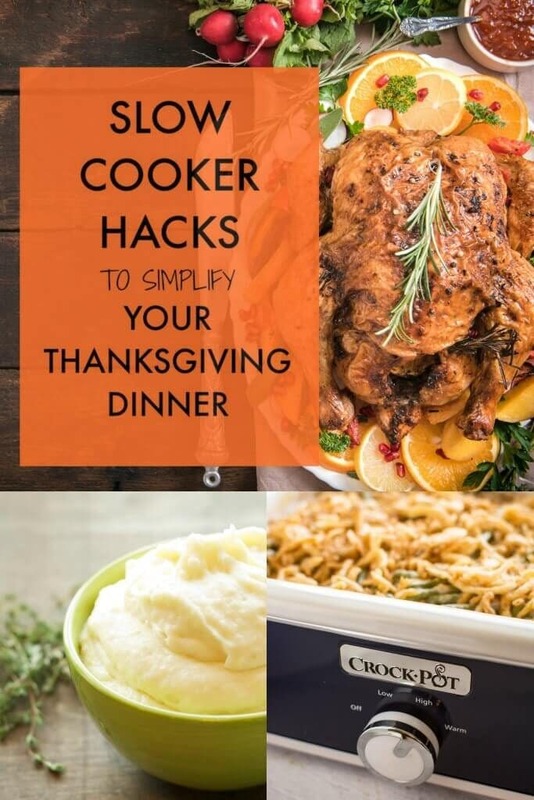 Probably not, only because most nights we are trying out new recipes and holidays tend to be our days to stick with our old favorites 🙂 But we will have this again either during a different holiday or during any meal that would go well with stuffing! If you are on the hunt for something a little different, this may fit the bill. 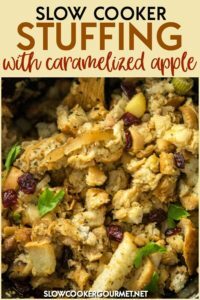 Slightly sweet from the apples and just a little tart from the cranberries, it has a fun fallish flavor that would go perfectly with a turkey or a number of any other meals. The best part? Using the slow cooker, of course. as a take-along to a pot luck! 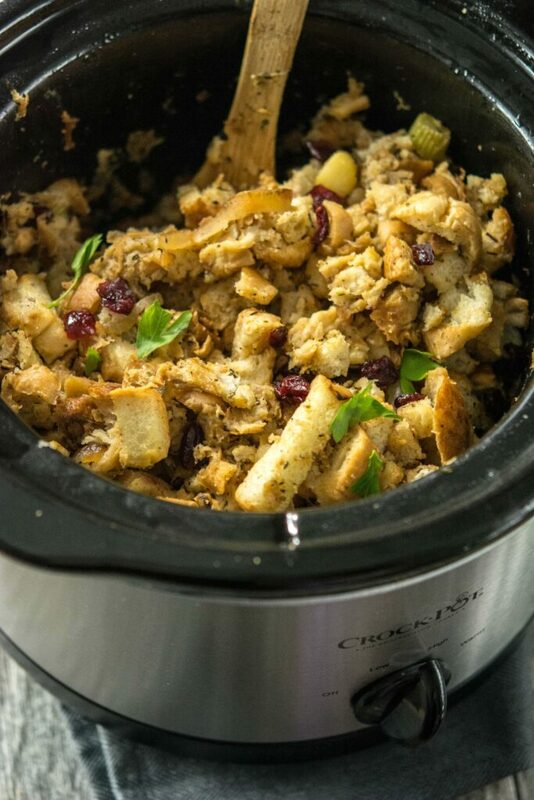 Need more slow cooker Thanksgiving Recipes? Check out all my tips and tricks right here! !